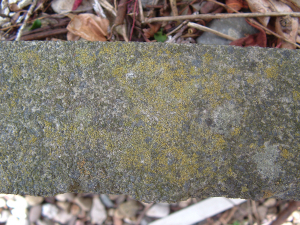 Small yellow cup shapes, distributed amongs grey crustose lichen (see previous observation), on upward facing concrete substrate in suburban garden. Is this a seperate species or is it the fruiting bodies of the grey lichen? Again, I'm finding it difficult to compare my photos with the nigh magnification photos such as found on www.britishlichens.co.uk.